Each of Rebus' incredible signet rings are handcrafted to be one-of-a-kind. Jewellery has the potential to say a lot about its wearer. Functioning as a unique expression of personal identity, it’s deeply rooted in sentimentality, nostalgia and emotion, and whilst often overlooked as merely aesthetic accessory to one’s clothing, it represents far more. The designers and craftspeople at iconic jewellery label Rebus know this, and thus make it their mission to create timeless pieces that convey significant meaning to the individual. 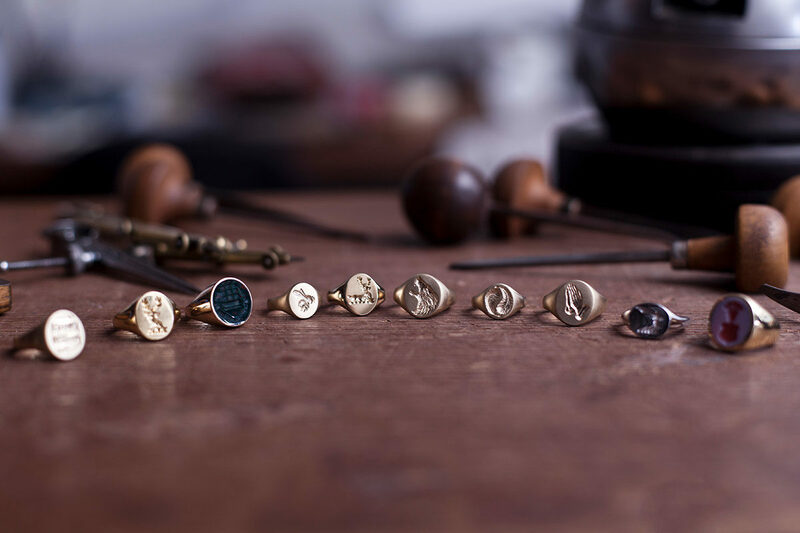 Signet rings are their cornerstone, with the team’s precious metal offerings lovingly die-stamped, handmade and hand-engraved at the brand’s newly refurbished in-house workshop in Hatton Garden, London’s famed jewellery quarter. Rebus is renowned for its devotion to symbolism and as such, each signet ring is deeply entwined with heritage and identity. The brand’s motto, ‘non verbis sed rebus’ is a Latin phrase that translates to ‘not by words but by things’, which conveys the rebus principle - the practice of using symbols and pictures to represent the sounds of words. For thousands of years, people have used symbols on signet rings to express what matters most to them, and Rebus enables the continuation of this tradition, providing clients the opportunity to personalise their pieces with symbols unique to their experiences or identity. Family crests are a popular choice, but more unconventional requests are increasingly received: Rebus’ director (and one of the company’s original apprentices) Emmet Smith recalls one for an intricately detailed mountain scene (as once dreamt by a client) and another of a replica of a loved one’s tattoo. Such a deep respect for the craft has remained at the crux of Rebus’ ethos since the company’s establishment in 1971 at the hands of Raymond Wilkins, one of Britain’s foremost jewellery industry figures. Since then, it has attracted some of the country’s most impressive hand engraving talent: each generation of Rebus engravers began work as teenagers, serving five year apprenticeships and spending years honing their skills and developing their own styles. Rebus now employs twelve craftspeople, some of whom have been with the company since 1975 - their tireless dedication to the preservation of craftsmanship is what drives the brand’s ever-growing success. In our current digital age of lasers and computers, hand engraving is an increasing rarity and the skill required for such a task is immeasurable. It is this incredible passion and attention to detail that differentiates Rebus from other more conventional jewellery labels and guarantees the purchase of a veritable piece of artistry, ultimately guaranteed to endure as an heirloom for generations to come.